Head In Knots: Why Am I Here? There is a new commercial running, that makes me want to cry every time I see it. It involves a series of dog pictures, clearly taken in a kennel. These dogs are happy and smiling, despite being in a cage, wagging their tails and shoving their noses at the camera. It is about the cutest thing ever. Then you hear the voice over. It is a man's voice, speaking on behalf of the dogs. It tells us these dogs know how to sit, know how to fetch, will cuddle up with you in your downtime. But what he can't figure out, is why he's in there, and where his family went. I have been searching for a dog. I don't know if they'll let me adopt one, today I got a dirty look because i work full time (even though I can sure provide a lot of love). But there are so many abandoned dogs at the SPCA, Animal Control, and various rescue groups around the area, that if a commercial like this really makes someone stop and think, I applaud its efforts. 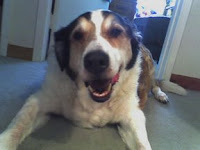 (that's one of the last pictures I have of my old pooch, taken a few months before we had to put him down. I miss ya, old Bocci ball).